The book of the week was Generation Earn by Kimberly Palmer. I loved it. I whole-heartedly believe that if this book had a bigger marketing budget and was really put out there, it would be a New York Times Best Seller right now. Palmer's writing style is very impressive; flows very nicely and nearly zero repetition. This book is absolutely a guide for the new era of finances we have stepped into within the last five years. Many people have had to make adjustments to lifestyles and a lot of those transitions were not planned. People have been thrown into these new lifestyles and Palmer really captures these different aspects of 'today' living: the good and the bad. Palmer has her book broken into three sections: Building Your Life, Creating a Home, and Giving Back. All great sections. And my favorite part of the book is the "Quick Tips" throughout the book that give all kinds of helpful ideas that relate to the chapter (Reminds me of a Tim Ferris 4HWW style). There are several parts of the book that I really like, so I am just going to dig into a few. There is an upside to debt. This is right on. Debt is not always a bad thing. It depends on your situation and the kind of debt you are using. For example... Student Loans: Great... 20% Credit Card holding balance: Bad.... Home Loan: Probably Good. Debt gets a really bad reputation because the people that end up trash talking debt are the ones that don't know how to use it effectively. Debt has lots of power and in the words of Uncle Ben (Spiderman reference) "With great power comes great responsibility." It is so easy to get out of hand with debt if you aren't smart about it. Some types of debt allow for easier mistakes. Credit Cards are culprits of being the easiest to abuse. Regulatory Laws on credit cards change every few years and recently lawmakers have tightened the reigns on CC companies. However, it's still really easy to get a higher limit and even easier to swipe that card on anything you want. Student Loans are relatively difficult to 'abuse' and Palmer even gives the suggestion of using income smoothing, which is using student loans to boost your standard of living while in school or underemployed because after you graduate and get a job you will be able to pay that loan off easily. However, she does make a point to say that doesn't mean you can go out to a concert every weekend or spend a few weekends in the tropics. Smoothing is about going out to a few nice dinners and avoiding ramen on a regular basis. Lastly, Home Loans... I love home loans, but if you aren't smart about doing your homework, you could get burned on purchase price or mortgage rate or points. Just do your due diligence and you'll be fine. Something else I liked in the book was the idea of parents or grandparents being the source of a loan with interest to a kid or grandkid. If you do this, then you avoid anyone defaulting and it gives the parent or grandparent a good rate of return on their money. This is especially handy in such financially unsettling times. The only thing I would want to address is the emotions involved. Don't fork over your life savings if you will be ruined without it... When giving to family, it's best to only use money that you will be okay if you never see it again. The last thing you need it a rift between family members and money has a tendency to do that. Just make good decisions for your own situation. The last thing I want to write about is philanthropy. Palmer throws out some shocking statistics. Well, I believe it, it just saddens me. "College graduates donate, on average 2.4 percent of their annual income." Now why the heck is this? I understand that people have childcare and cars to fix and debt to pay off, but 2.4%? If anything that number should be much closer to 5% although 10% is the goal. According to the author of The Happiness Project, people that donate money are actually happier because when you have money away you convince yourself that you are doing pretty well. So, switch to basic cable or go the bars less often and feed some hungry children or give it to one of God's churches instead. God is the best business partner you will ever have and all he wants is 10%. And now I am stepping off the soap box. 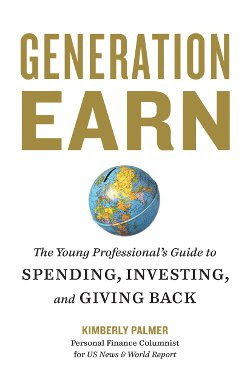 Generation Earn is an awesome book with some new world financial ideas. I highly encourage picking this one up! As always, if you have any questions on the book don't hesitate to ask. I would be more than happy to help anyone that wants it.